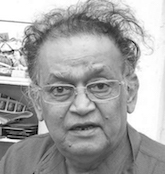 Sunil Das was born in 1939 in Calcutta. From 1954 - 1959 Sunil studied in Government College of Arts and Crafts, Kolkata. From 1961 - 1963 he won the French Government Scholarship to study art at L’ecole Nationale Superieure des Beaux-Arts, Paris. His works have been included in the Biennales of Paris, Dacca, Cuba and Tokyo and in the Triennales of India. In 1959 he won the Gold Medal from Government College of Art and Craft, Kolkata. In 1960 he won the Gold Medal from Calcutta University in Kolkata and he received the French Government Scholarship. In 1983 he served as a commissioner of the Triennale, India. In 1989 he served as the commissioner of Sao Paulo Biennale, Brazil. In 1991 he received the Shiromani Kala Puraskar (National Award), Kolkata. He was a member of the jury of the 'Pfix des Etrangeres' in Paris. In 2008 he won the Taj Ratna award. In 2014 the Government of India conferred on him the Padma Shri. His works are in major private and corporate collections in India and overseas. In 2015 Sunil passed away in Kolkata.